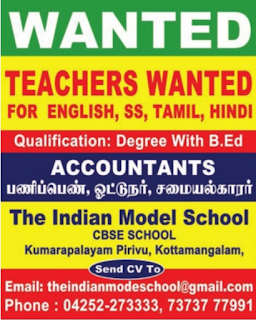 The Indian Model School, Kottamangalam has advertised in THE DINAMALAR newspaper for recruitment of Teachers/ Non Teaching Faculty jobs vacancies. Interested and eligible job aspirants are requested to apply immediately.Check out further more details below. 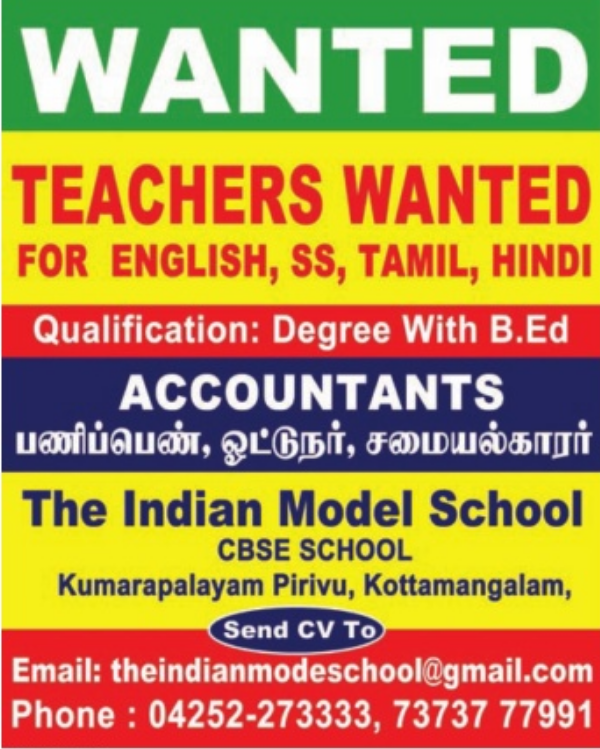 Name of the School: The Indian Model School, Kottamangalam. About School: The school started its journey with the Primary Classes and in due course of time and dedicated efforts the school evolved into full-fledged Secondary School. And now TIMES is affiliated to Central Board of Secondary Education. TIMES is a co-educational school which offers classes from nursery upwards, providing a blend of academic, sporting, cultural, and artistic activities, which contributes to giving our students a world-class education with lifelong benefits. (b) Fluency in English is Must.